Aviation Updates Philippines - Ethiopia's flag carrier, Ethiopian Airlines, plans flights between Addis Ababa - Bangkok - Manila flying three times a week. Flights between Addis Ababa to Manila via Bangkok will be operated by a Boeing 787-800 Dreamliner beginning March 30, 2015, just in time for the upcoming summer season. Flights between Addis Ababa and Manila via Bangkok depart Addis Ababa at 12:40 am and arrives Bangkok at 1:20 pm. It stops at Bangkok for an hour and a half and departs for Manila at 2:20 pm. As flight ET628, the flight will arrive Manila at 7:00 pm. Ethiopian Airlines flies to Manila on Mondays, Wednesdays, and Fridays. The return flight, Ethiopian Airlines flight ET629 departs Manila at 10:00 pm after a 3 hour stop, and arrive Bangkok at 12:25 am of the next day. It departs Bangkok at 1:35 am and arrives back to Addis Ababa at 6:30 am. Reservations for Boeing 787-800 flights to Manila started a week ago. The carrier's Boeing 787-800 Dreamliner features full flat seats in business class and the world's latest in-flight entertainment. It has state of the art on-demand Audio and Video services with 15.4 inch IFE screens and 85 channels in Cloud Nine and 8.9 inch and 80 different channels in Economy Class, offering an array of entertainment to passengers of all age, according to its website. 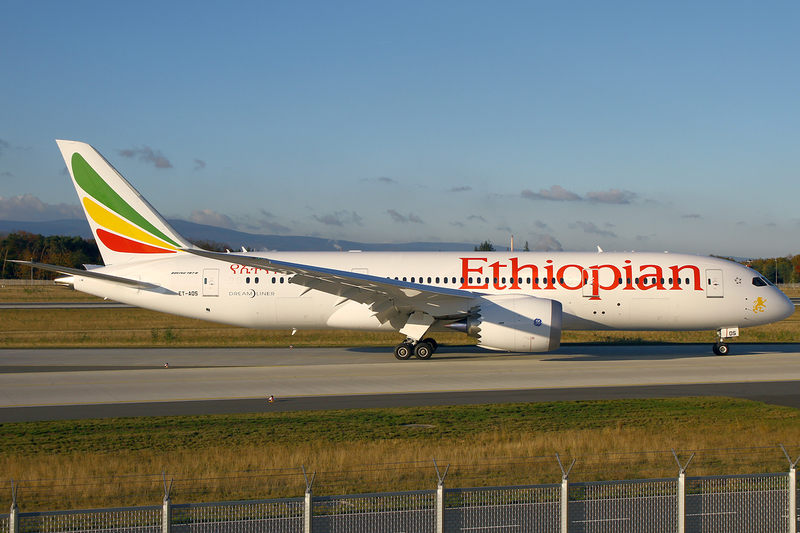 As of May 2014, Ethiopian Airlines currently operates flights to 79 international and 18 domestic destinations, with 48 passenger destinations in Africa, 11 in Europe and the Americas, and 21 in the Middle East and Asia; the airline also operates a cargo network of 24 destinations, 15 of them in Africa, two in Europe, and seven in the Middle East and Asia.